I find it difficult to pick up any new Spider-Man book. I feel like I’ve read it and seen it all at this point. This is 40 years plus reading Spider-Man. I’m sure there’s stories to tell. With as many “Spider” books out there, Marvel is nowhere being done. Where does this leave Spider-Man Life Story? The concept is that Peter Parker’s life is told in real time. Ok…bet that’s been done before…except…Chip Zdarsky and Mark Bagley telling this story. I’m on board. The issue starts in 1966 and it’s four years after Peter was bitten by the radioactive spider. Mr. Parker is having a hard time making it to things on time. It’s not really out of the norm for Pete. The book gives us a look at how Peter might have reacted to the Vietnam War. Zdarsky doesn’t avoid that Iron Man and Captain America have to get involved as well. It’s how they choose to get involved is what matters. 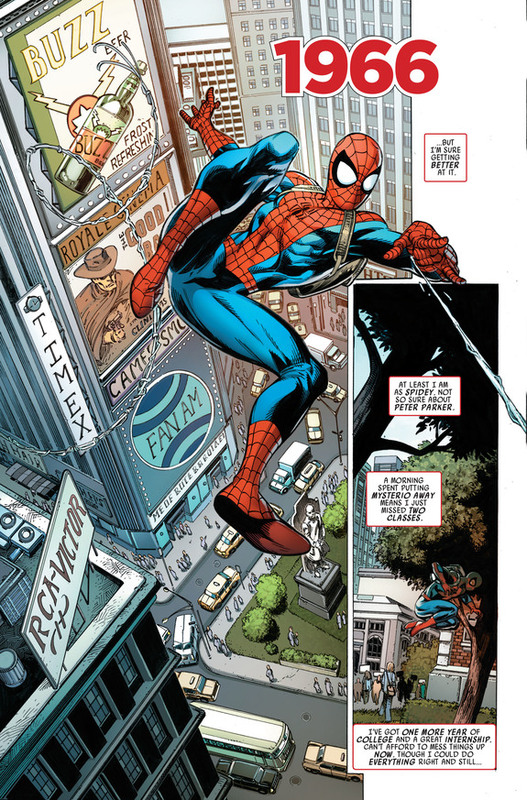 The issue changes what happens to Peter and the supporting cast. Certain events that changed comics and Peter as a whole. Mark Bagley is no stranger to illustrating Spidey. His Spider-Man here reflects the Spider-Man of the ’60’s. It’s a subtle difference between how his drawn Spider-Man over the last 20 plus years. The end of the book jumps to 1967 and gives us something to question our alliances. It’ll be interesting to see where the book goes from here.